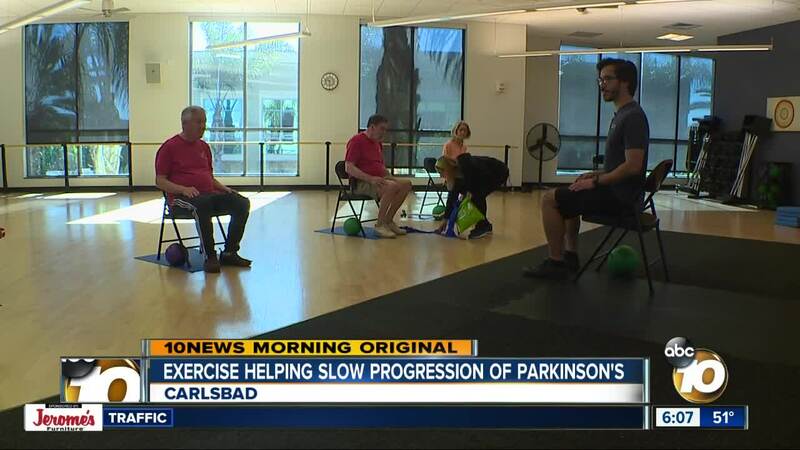 A program at the Tri-City Wellness Center in Carlsbad has found that combining exercise with normal methods of treatment can help slow the progression of Parkinson's Disease. In some cases, it's also reversing the symptoms. CARLSBAD, Calif. (KGTV) - A new program at the Tri-City Wellness Center is proving that exercise may be the best medicine. The Medical Integration Program combines traditional treatment with several different forms of physical therapy. Among patients with Parkinson's Disease, it's helping to slow the progression of the disease and also reversing the symptoms. In some cases, the results are immediate. "You feel better after you do it; even while you do it, sometimes," says Gary Larson, who was diagnosed with the disease three years ago. The Tri-City Wellness Center began developing the program in 2017, with classes starting in August of that year. In addition to the physical benefits, people in the class say it has given them a community, more support and a better quality of life. "Parkinson's is a very isolating disease, where people don't want to get out," says Marty Acevedo, who helped develop the class and is also living with Parkinson's. "This program gets them out. It gives them a sense of camaraderie within the group, and we have a lot of fun." The class meets with a trainer several times each week. Participants are also encouraged to do more physical activity on the other days. Larson says he does yoga, dance classes, tai chi, aquatics exercise, weight lifting and walking on the days when he's not in class. He says his nine children and 36 grandchildren are his motivation. "When it comes right down to it, the only thing important left in my life are my grandkids and how they turn out," he says. "Most of them don't know me other than through Parkinson's. My desire is to be something besides a Parkinson's grandpa." Tremor. A tremor, or shaking, usually begins in a limb, often your hand or fingers. You may a rub your thumb and forefinger back-and-forth, known as a pill-rolling tremor. Your hand may tremor when it's at rest. Slowed movement (bradykinesia). Over time, Parkinson's disease may slow your movement, making simple tasks difficult and time-consuming. Your steps may become shorter when you walk. It may be difficult to get out of a chair. You may drag your feet as you try to walk. Rigid muscles. Muscle stiffness may occur in any part of your body. The stiff muscles can be painful and limit your range of motion. Impaired posture and balance. Your posture may become stooped, or you may have balance problems as a result of Parkinson's disease. Loss of automatic movements. You may have a decreased ability to perform unconscious movements, including blinking, smiling or swinging your arms when you walk. Speech changes. You may speak softly, quickly, slur or hesitate before talking. Your speech may be more of a monotone rather than with the usual inflections.